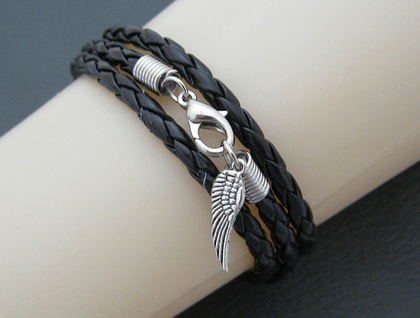 Leatheroid Triple Wrap Bracelet: black imitation leather with silver-coloured clasp and angel wing – last one! 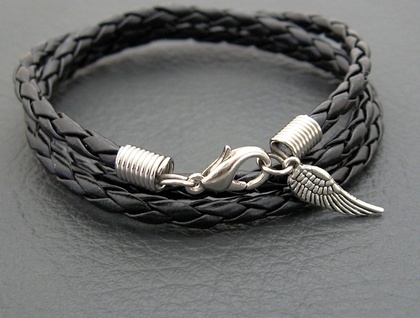 The cord ends and clasp are plated with nickel, so people who are allergic to nickel will not be comfortable wearing this bracelet. A gold-plated version of this bracelet is also available here in my Felt shop. This is the last of the silver versions of bracelet that I have available. I can add an extension chain (at no charge) if you want to be able to control precisely how the bracelet will fit. 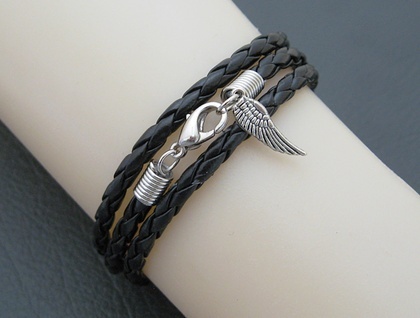 The chain will be relatively short, so that there is not a long tail of chain dangling from the bracelet, but it will allow you to adjust the fit with greater precision. One of the photographs shows the extension chain. 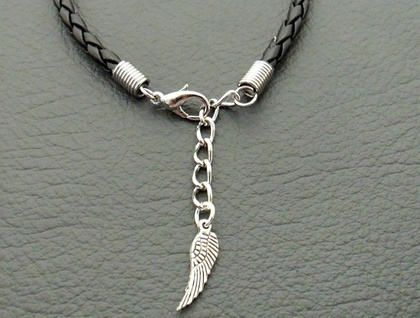 If you would like an extension chain on your bracelet, simply leave a message in the 'notes to silverlight' field that will appear when you check out of Felt.